But the critics, in their eagerness to denigrate the country they regard as irredeemably simplistic, miss its complexity. There is another history of American military intervention which points to rather different conclusions. History suggests that for the American public to continue its support for a protracted struggle, three conditions must be met. They must be convinced that their cause is a noble one. No country in the world is as animated by ideals as Americans. But idealism alone will not suffice. Even Americans won’t in the end fight for abstract principles, or for somebody else’s freedom. The second condition is that a war must be seen as being conducted against a threat, immediate or emergent, against Americans. Thirdly, Americans will back a lengthy war only if they believe their leaders have a clear strategy for winning. In the end it was not lack of faith in the cause in Vietnam that undermined support for the war among a majority of the US population. It was a steadily strengthening conviction that their leaders had given up believing the war could be won. Red America understands that war is violent, painful, and lengthy - especially the Global War on Terror (GWOT), which Red America understand will take not days, weeks, months, or years - but decades. Blue America was shouting, "Quagmire!" before the first boots were in the sand in Afgnanistan; "Quagmire!" in Iraq weeks after Coalition forces first entered Iraq (and, fittingly ironic, only days before Baghdad fell); and continue to try to turn our efforts in Iraq into another Vietnam - a comparison that finds no basis in reality, and which serves only to advance Blue America's true agenda: to undermine the American military in order to prove the ultimate illegitimacy of the action, and of the Commander in Chief who leads it. Iraq today still meets criteria one and two. It remains a noble cause, in keeping with the highest American ideals — liberation of a people from a hideous tyranny. And it is a fight in defence of America’s interests. Establishing a democratic base in the Middle East remains the key to overturning the ideologies of fundamentalist hate that are the root causes of terrorism. Red America understands these two fundamental truths about America's action in Iraq. Blue America has become so rabid in its anti-Bush rhetoric that it finds itself in the untenable position of arguing against these truths. It is fulfilling the third condition that may be hardest now. Americans wonder increasingly whether their political leadership has a clear idea of where the struggle in Iraq is headed. At times they wonder whether their leadership actually knows or understands what is going on. No one can set out a detailed path to victory against an insurgent enemy. But the Bush Administration needs to demonstrate a commitment to getting the job done. That means not only protestations of resolve, but actions to back it up; specifically more troops if needed. Otherwise the steady attrition of support will gather ominous momentum. Only Blue America - led by the seditious partisanship of the American Mainstream Media - continually questions the "Plan" for Iraq, and GWOT. Red America knows beyond doubt that the Administration in general - and President Bush in particular - understands depth and breadth of global terrorism, and the devastating consequences of pursuing any course other than taking the fight to the terrorists in the heart of the breeding ground of international terrorism. Let us not forget: a mere seven months ago, a record number of Americans voiced their opinion of Bush's grasp of GWOT - and overwhelmingly (and by both a record number of vote total and difference) indicated support for the President. Red America - and make no mistake, America has made a decided shift from blue to red in the past 10 years - stands in support of military action in Iraq, in support of America's overall effort to eradicate international terrorists and regimes that harbor them, and to defend America's borders from ever suffering another 9/11. Red America is in it for the long haul - and Red America has unending belief that America - and freedom - will prevail in the end. In classic Savage Style, Liberalism is a Mental Disorder brings to a conclusion the author's trilogy concerning defending America from Liberal assault. Dr. Savage poses several problems facing America, and from his unique perspective presents "Savage Solutions" for each. Savage takes on such hot-bed issues as Iraq, Islamofascism, illegal immigration, assault-by-litigation on American businesses, revisionist history, the ACLU, and current American political shifts. Savage holds no punches from either the Democrat or Republican parties, and reserves none of his disdain for lack of true political debate from the "Demicans" and "Republicrats" that run Washington. While the rhetoric is occasionally over-the-top, the underlying truths are undeniable for most of the issues covered in the book. I am disappointed, however, that Dr. Savage has apparently bought into the liberal media's propagandist views on Iraq, and takes a decidedly negative outlook on the eventual outcome - an outlook with which I wholeheartedly disagree. That issue aside, I consider Savage's views to be the far-right boundary, without being too extreme for reasonable debate - practical solutions to the issues addressed may or may not include his Savage Solutions. In the final tally, Savage is right more often than he is wrong (in fact, his take on Iraq is the only one with which I take major issue). The book is a fun read - especially for the reaction it ilicits from Liberals who might happen to catch you reading it. Tired of the hypocritical lifestyle and propogandistic, out-of-context, mis-informing, mis-directing, and outright-lying work of Michael Moore, authors David T. Hardy and Jason Clarke penned Michael Moore is a Big Fat Stupid White Man to expose and refute this Liberal poster-child. The book is painstakingly researched, tirelessly footnoted, pointedly critical, and brutally revealing; the book exposes the truth of Michael Moore's life, lifestyle, beliefs, and work history; and most importantly for those taken in by the filmmaker and author's work, the book uncovers the truth about Moore's works, from Roger and Me, to Stupid White Men, Bowling for Columbine, Dude, Where's My Country, and the pinnacle: Fahrenheit 9/11. The book is a damning revelation of Moore's complete lack of scruples, loyalty, or integrity in his life and work. From deceptive camera angles, to taking quotes and speeches out of context and chronology, to manipulation of sequence, to subjectively choosing facts, to intentional deception, and outright lies, the book unfolds the truth behind Moore's manipulation and lies. For anyone tired of defending the liberal non-arguments posed by Moore's propogandist works, this book brings much-needed context and firepower to disarm Moore's blind followers on the Left. Letters To A Young Conservative, by Dinesh D'Souza, is, as the title implies, a collection of letters from the author's correspondence with a fictional Conservative college student. The letters touch most of the major issues. Since each chapter is a letter, the result is episodic with a logical progression from one topic to the next. The content can be consumed in chunks, or read easily in a few sittings - or even in a single sitting. This book was my first exposure to D'Souza, but assuming it is indicative of his other writing, it will certainly not be my last. D'Souza has a firm, foundational, and eloquent grasp on the issues he addresses. His wit is nearly as acerbic as Ann Coulter's, but his style, paradoxically, is disarming. As part of the Art of Mentoring series, the book is comprised of 31 short chapters (ranging from 4-16 pages, with most less than 10), written as letters addressed to a fictional college student named Chris. Each "letter" addresses a different issue, beginning with modern definitions of Conservativatism and Liberalism, and continuing with Libertarianism, how D'Souza - from an Indian immigrant family - became a Conservative, political correctness, multiculturalism, classical literature, Ronald Reagan, government as a societal problem, class warfare, affirmative action, feminism, post-modernism, liberal academia, media bias, judicial activism, gun rights, debating liberals, liberal mis-education, Abraham Lincoln, self-esteem, environmentalism, gay marriage, family values, abortion, anti-globalism, immigration, anti-Americanism, the Republican party, and why Conservatives should be cheerful; and ends with an exhaustive book list for Conservatives. Given the short, letter-style chapters, and D'Souza's eloquence, this book is an easy and enjoyable read. While certainly geard toward 18-30 year olds, I would recommend this book to anyone as a primer on modern Conservatism from the mind of a young Conservative leader. To understand What modern Conservatism is, where it is, and where today's generation of young Conservatives is taking it, you need look no farther than D'Souza's Letters to a Young Conservative. You better believe it. Every morning when we wake up in the Imperial Palace, we jump out of bed and set off to smother anything remotely resembling a sense of social well-being, whatever the Hades that might be. Then, after a half a gallon of coffee and a dozen cigarettes, we're off to a hard day's work of shoving grannies in wheelchairs down stairs (having made sure to steal their Social Security checks first, of course), kicking puppies and writing long and indignant letters to PBS, demanding that they immediately send the entire cast of Sesame Street to Gitmo on charges of subversive activities. And that's just before lunch. The afternoons are typically spent converting everybody in sight to Christianity at gunpoint by uttering deadly phrases such as "G-d Bless You" at unsuspecting secularists. Read the whole thing; he holds no punches deconstructing this liberal waste. 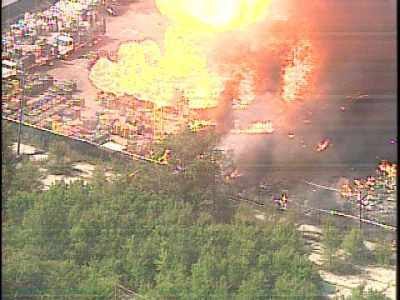 Right now I'm watching coverage of an explosion at Praxair Distribution in south St. Louis (Jefferson and Chouteau). 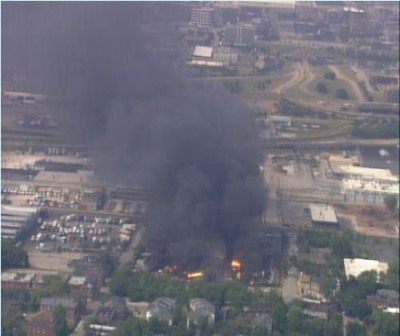 The blaze began around 3 p.m. at Praxair, a gas and tank company at 2210 Chouteau. 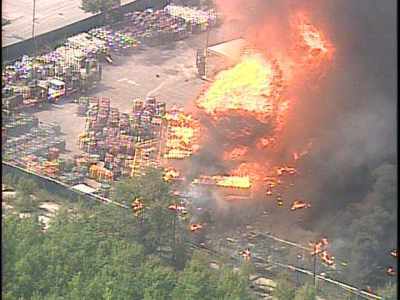 As of 4 p.m. a policeman at the scene said no injuries had been reported. Explosions had slowed to perhaps one per minute from the frenetic pace of earlier in the afternoon. More than a dozen emergency vehicles were at the scene. As I write this, Highway 40 is being shut down between the Poplar Street Bridge and Kingshighway - though tonight's Cards game is not expected to be interrupted.